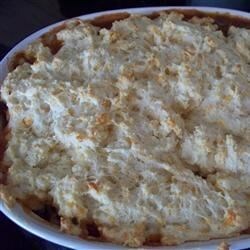 "Very quick easy comforting casserole dish made with ground beef, and topped with a cheesy biscuit puff." Melt 2 tablespoons of shortening in a large skillet over medium-high heat. Add the onion and ground beef to the pan, and cook until onion is tender and beef is browned, stirring frequently and crumbling beef. Drain fat. Season with 1 teaspoon of salt and pepper, then sprinkle 3 tablespoons of flour over the top. Pour in the tomatoes and Worcestershire sauce, and stir to blend everything. Cook for a few minutes, until slightly thickened. Stir in the carrots and green beans, then transfer to a 2 quart casserole dish. In a medium bowl, stir together 1 cup of flour, baking powder, mustard powder and 1/2 teaspoon of salt. Cut in 2 tablespoons of shortening until only small lumps remain, then stir in the cheese and milk to make a thick batter. Spoon over the top of the casserole, and spread evenly. Bake for 25 to 30 minutes in the preheated oven, until the top of the puff is golden brown. Not very good at all. I thought the biscuit puff would come out better for some reason. I'd have been better off with hamburger helper.